Dandelion was a little wild bunny who came to Cottontails with his family and friends when his nest flooded. After about five seconds he made himself at home and started nibbling on skirting boards, doors, table legs, blankets and furniture. Dandy could squeeze himself into very small spaces, like under the sofa and the TV trolley, and he chewed and chewed. For a little bunny, he sure caused a lot of damage. “NIBBLER!” would cry Mrs James whenever she heard a nibbling sound, but by then Dandy had usually done his nibbling and moved on to his next rabbit project. Ever since he was a tiny baby Dandy wanted to be a working bunny because he loved helping people and keeping busy. After nibbling his favourite activity was answering the phone so he wanted to be a receptionist when he became a big bunny at 6 months. One day Dandelion needed to call his friend Floppy to invite her to a party. He expertly nudged the telephone and chewed the soft rubber buttons, then the wire was in his way so he gave it a good nip. When Mrs James tried to ring Floppy’s mum a little later, the telephone was mysteriously out of order and she had to go to the neighbours to call the telephone engineer. “Oh dear!” Mrs James felt extremely silly because she had forgotten to bunnyproof the telephone wire. “These bunnies are true professionals,” she thought, “I must give them lots of things to chew or they will nibble the whole house down”. Later that day Mrs James had a meeting with the foster bunnies. “It wasn’t me!” said Buttercup as he munched through a nectarine. “It wasn’t me!” said Peanut while tucking into a juicy pear. “It wasn’t me!” said Sweetpea, who thought the best thing about meetings was the food. 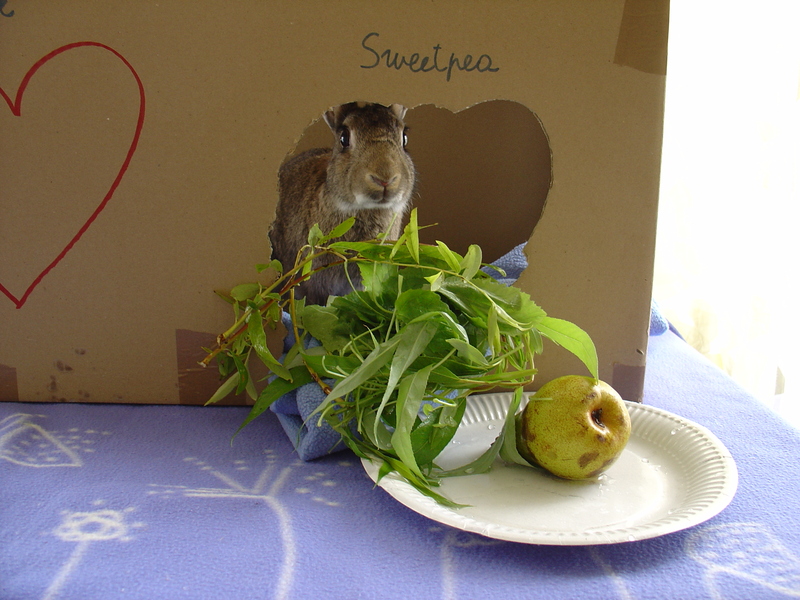 Foster bunny Lucky pretended not to hear the question and helped himself to a second portion of Mrs James’ homemade banana and strawberry salad. This only left Dandelion, but he was incredibly busy reading the Chews of the World and could not be disturbed. “It’s nobunny’s fault,” said Mrs James, “bunnies were born to nibble”. “And Dandy certainly loves his job!” she thought. Then she gave Buttercup, Dandelion, Lucky, Sweetpea and Peanut a big hug and they had their afternoon siesta on the sofa. The telephone nibbler was never caught, though Mrs James had a very good idea who it was. Tip If your rabbits come indoors remember to bunnyproof your telephone wires or they will get nibbled! Rabbits also like to chew on electric cables, which is very dangerous. You must always cover them to prevent accidents. You can buy cable covers from DIY stores.